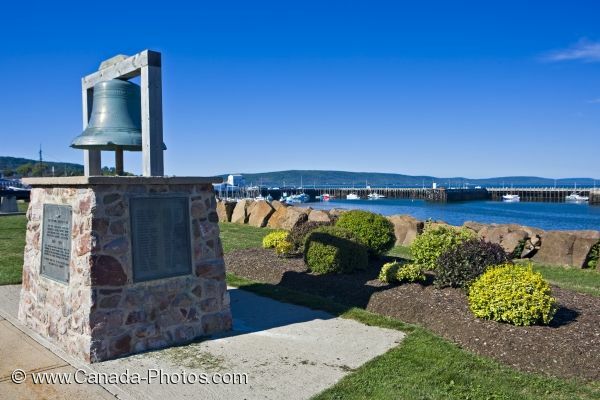 A monument of a warning bell is on exhibit along the waterfront in the town of Digby in the Bay of Fundy, Nova Scotia. Over the years, many men cruised the waters of the Annapolis Basin, Digby Neck and the Islands in the Bay of Fundy in Nova Scotia, Canada and this monument was erected for those men whose lives were lost between 1867 and 1967. Plaques displayed in stone around the monument tell a short tale of their lives and a list of names who are remembered. The monument is of a hand operated warning bell situated around the perfectly manicured gardens along the waterfront of Digby, Nova Scotia. Hand operated warning bell - a monument to the seafaring men of the Annapolis Basin, Digby Neck and Islands, who lost their lives between 1867 and 1967, along the waterfront in the town of Digby, Evangeline Trail, Highway 101, Bay of Fundy, Nova Scotia, Canada. Picture of a warning bell monument amongst the gardens in the town of Digby in the Bay of Fundy, Nova Scotia, Canada.